I like to take traditional recipes and deconstruct them. It started a few years back when I began trying to explore how and why certain tastes work together and how ingredients and elements added earlier or later or not at all, change an entire dish. This is a classic example. What follows is one way to get you started. Make it once and then play around with it, personally, I’ve made basically this same recipe at least 50 different ways. After we’re all said and done, I’ll throw you a few easy variations at the bottom. Quick disclaimer for all your purists this Shepherd’s Paleo Pie uses beef instead of lamb so technically it is a Cottage Pie. The two meats are basically interchangeable in this recipe so use whichever makes you happy. Or you can so as the Fiance does occasionally when she makes her own version which, is to use Lamb and sing the theme to “Lamb Chops Play Along” as she cooks. Last little thing before we get some fantastic meaty goodness going, this particular version is customized to my local farmers market, The Rockmart Farmers Market and what is in season and available at the beginning of market season in May. In this case, the Grass-Fed Beef came from Timberland Farms, the Spinach and Lard from Morning Glory Farm, the Cauliflower from Spreading Oaks Farm, the Onions from Five Cedars Farm and the radishes from our own garden. Yield: Technically 8-10 Servings but probably 4-6. 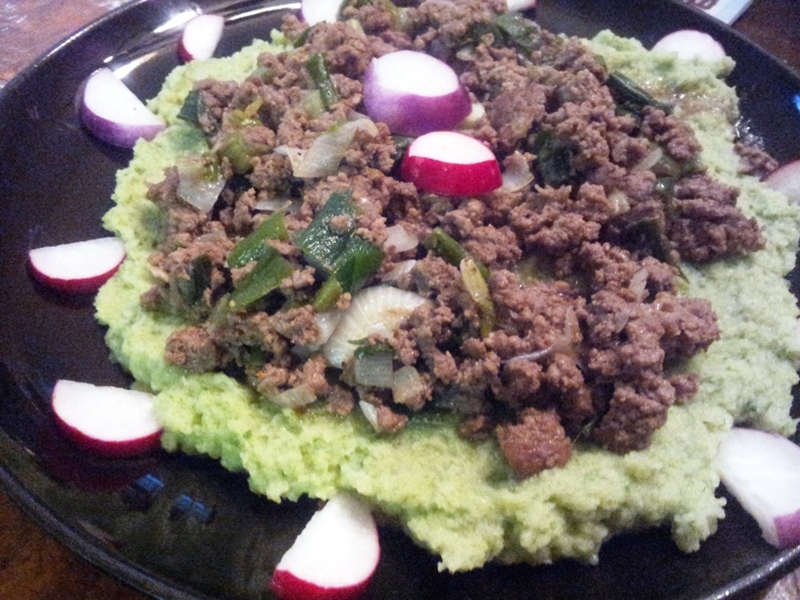 Shepard's Paleo Pie with Green Mashed Cauliflower and Radish Garnish. Quick and easy weekday family favorite! Kids will love the Green Cauliflower mix or leave it white and don't tell them it isn't mashed Irish potatoes. Rinse all produce under cool running water and let sit to dry. Prep Onion by removing outer most layer. Chop Cauliflower into roughly half dollar sized pieces. Set steamer basket in pot and add water to pot just to the bottom of the basket or alternatively simply add a few inches of water to the bottom of the pot and bring to a boil. Steam 6-7 Minutes, until the mixture is tender enough to be mashed by hand. While the veggies are steaming, heat skillet on medium to medium low heat, add Lard. Chop the rest of the Onions, Garlic, Radishes and Carrots. Veggies should be about done. When they are remove from heat and drain, add butter, salt and pepper and set aside. Leave the butter out for pure Paleo, leave it in for Primal. As meat has started to brown add Garlic, Onions, Carrots and Bone Broth. Continue cooking until done. "WARNING Grass-Fed Meat will cook faster than Industrial Meat." Plate by adding the Cauliflower to a plate in a flat layer, layering the beef with juices over top and using the radish to garnish. Feel free to use a different spice blend, once you’ve made it once you will see how it lends itself to the use of spices. 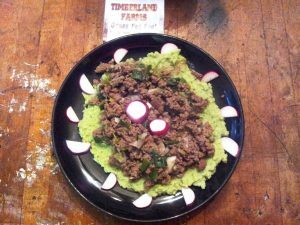 Tumeric and Allspice are two I use when I use lamb, it gives it a North African flavor. You can also put the meat in a casserole dish when it is done, add the mash mixture on top and bake until slightly brown to get a traditional look.